Day Three of Kozfest started out quite unexpectedly. Ozric Tentacles guitarist and founder Ed Wynne had made his presence known simply by being in attendance at some of the weekend’s spectacular performances, highlighted by such bands as The Roz Bruce Infusion, Magick Brothers, The Cary Grace Band, and Zofff. This was despite the rain and wind that grew more intense on the final day of the festival, eventually turning the main path through the grounds and the road down the hill to the entryway into virtual swaths of mud. Late Saturday evening, sometime before headliners System 7 took the stage, the buzz around the soundboard and merch table area was that Wynne was planning some kind of get-together. Simon Edgley, known as a former festival organizer and a watcher of merchandise, had suggested strongly to be at the Daevid Allen Kozmik Stage at noon the next day. 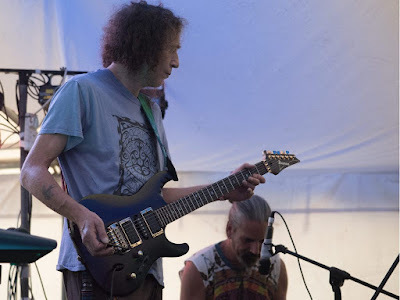 Following the morning’s breakfast, Wynne and former members of the Ozrics, along with members of The Hawklords and The Ullulators, delivered an unannounced psychedelic free-form jam that lasted more than 70 minutes. 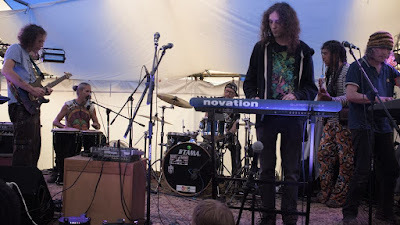 The members of the band included Wynne – guitar, synth; son Silas Wynne – synth; Joie Hinton – synth; Tom Ashurst and Derek Chai, who traded bass duties; Paul Hankin – percussion; and Nick Van Gelder – drums. Following a slow intro, the music picked up in a fiery way with waves of sound. The emotional impact was a kind of magical feeling, as though at a waterfall in a journey through time to a distant land. Transcendent funk fusion, the guitar became increasingly psychedelic, Wynne picking fiercely. The synths created a storm like the weather in the forecast, Hinton and Silas comping with cascades as Wynne traversed the lower to upper registers and back down like gravity surfing. Synths rained upon the audience then sustained as they morphed and changed in color and tone. The pulse steady, drums riffing relaxed and fluid, Wynne moved to keyboards and back to guitar, expanding into another realm as he ran down a psychedelic trail like prey escaping its pursuer. The bass was laid down in a relaxed vamp improvising with the drums, the band flooding the room with sound then lowering in dynamic intensity, Wynne working the tremolo up and then down, picking wildly. During a break between improvisations, Wynne said to the audience, “We’re all just following it to see where it takes us. We all love to change though.” Keyboards like telephone dialing within the beautiful realm between time and space, the pulse was consistently steady, patterns being formed over other patterns with bird-like calls to intra and interstellar beings. 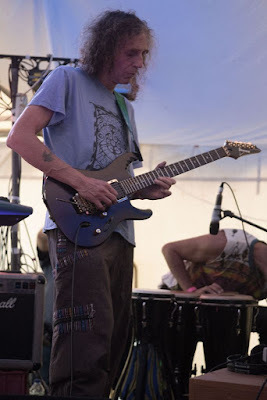 Wynne, Silas and Hinton called out to the universe as though speaking an ancient alien musical language, the rhythm building into a weather pattern very much like the wind and rain storm that was happening outside of the tent. Wynne’s chords felt like cold against your face as he progressed into feedback, manipulating his tone.